Sarah Catharine Cox (1838-1913) was the second born child of Eli B. Cox and his wife Nancy. Her father was a farmer on Tillery Road in District 12 of Knox County. 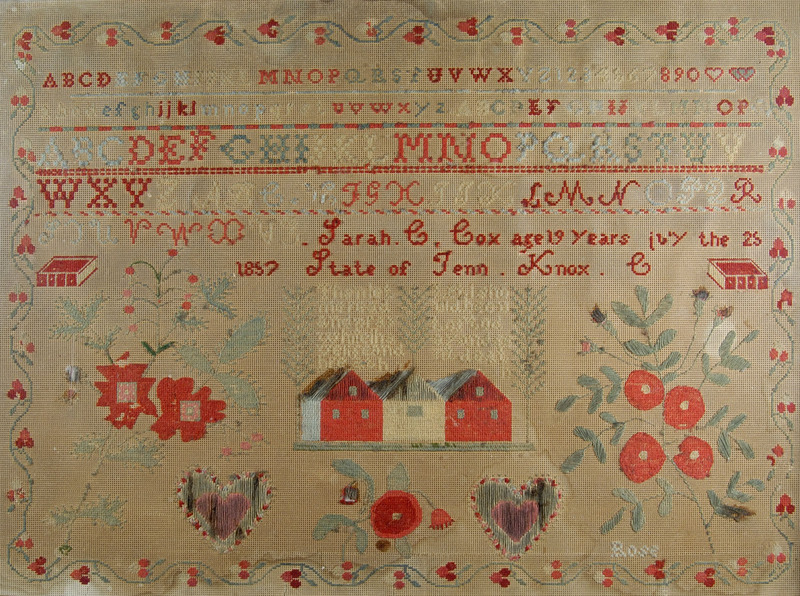 Sarah was 19, older than most girls, when she stitched her sampler on perforated paper. She may have been a teacher stitching an example for her students. She married Jefferson Jett Tillery in 1859. Jett Tillery was also a farmer. The couple had eight children. They attended the Bookwalter United Brethren Church in Knox County. Sarah died in 1913 and her husband died in 1922. Both are buried in New Gray Cemetery, Knoxville, Knox County. 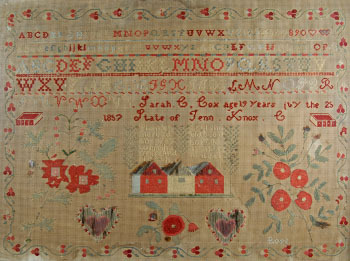 Sarah completed her sampler on her nineteenth birthday. The wool and perforated paper she used are unusually fine. Sarah’s roses, worked with satin stitch and back stitch, must have been difficult to execute on perforated paper.